Russia and the Soviet Union 7 Edition This lucid account of Russian and Soviet history presents major trends and events from ancient Kievan Rus’ to Vladimir Putin’s renewed presidency of the twenty-first century. Russia and the Soviet Union does not shy away from controversial topics, including the impact of the Mongol conquest, the paradoxes of Peter the Great, the "inevitability" of the 1917 Revolution, the Stalinist terror, and the Gorbachev reform effort. Tackling those topics and others, Thompson’s seventh edition is updated to discuss the flawed parliamentary elections to the Russian Duma in December 2011 as well as the election of Vladimir Putin to a second non-consecutive term as president of Russia in March 2012. Recent sociopolitical changes are reflected in a thoroughly rewritten Chapter 15 on the "New" Russia and a new Chapter 16 discussing Vladimir Putin and Dmitri Medvedev. 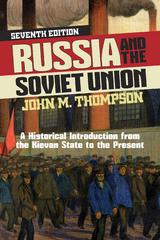 Distinguished by its brevity and amply supplemented with useful images and suggested readings, this essential text provides balanced coverage of all periods of Russian history and incorporates economic, social, and cultural developments as well as politics and foreign policy.